The Cardinals’ release of veteran non-roster invitees Alex Cora and Koyie Hill on Sunday wasn’t the type of transaction that jumps off the computer screen at you, but it was another signal of how the organization has changed in recent years. Five years ago, and perhaps even more recently, Cora and/or Hill probably would have stuck around because of Tony La Russa’s love of experience and the minor league system’s lack of available talent. 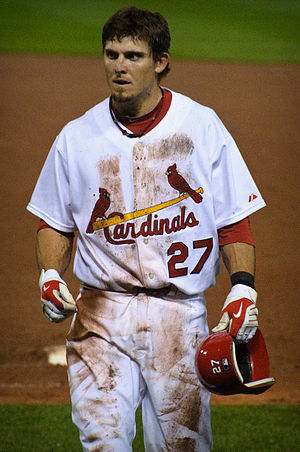 Now, Tony Cruz and Bryan Anderson are ready to back up Yadier Molina, and Daniel Descalso/Tyler Greene and Matt Carpenter are ready to back up the infield spots. Just as importantly, John Mozeliak and Mike Matheny are willing to award them those spots. While people rightfully focus on the stars a farm system produces, it also is important to produce players who can fill bench spots and bullpen roles. When you account for those positions internally, you develop cost-controlled assets and give your prospects’ upside a chance to shine through. When injuries or other issues inevitably occur (say, one of your starting pitchers has a re-occurring nerve issue), you can patch that hole with someone already in your organization, rather than spending resources to look elsewhere. Just how much has the organization’s philosophy about young players and the development of those players shifted? To answer that, I went back to 2000 and looked at the top 15 hitters by plate appearances and top 15 pitchers by innings that the Cardinals used each season. Then, I counted how many the organization either drafted, originally signed or acquired while still in the minors (discounting those who returned after playing elsewhere, like John Mabry). This is only a very quick and dirty way to measure this phenomenon, but nonetheless I think the resulting graph illustrates the point. The number for 2012 is just a projection and could change based on injuries and acquisitions, but I wouldn’t expect it to change much. Jeff Luhnow, who just took the GM job in Houston, became the Cards’ VP of Scouting and Player Development at the end of the 2006 season. A year later, Mozeliak took over the GM job from Walt Jocketty. It’s not a coincidence that the number of homegrown players spiked upward in 2008, has held steady since and perhaps is now trending even higher. While Jocketty’s veteran-heavy approach that included frequent trades for star players (see: Rolen, Edmonds, McGwire) worked brilliantly in its time, that time has passed. Developing from within is the key to success in today’s MLB landscape, especially when you’re not one of the financial heavy hitters. Even Jocketty’s 2010 division champion Reds team was an example of this, with 14 homegrown players, including stars like Joey Votto and Jay Bruce. 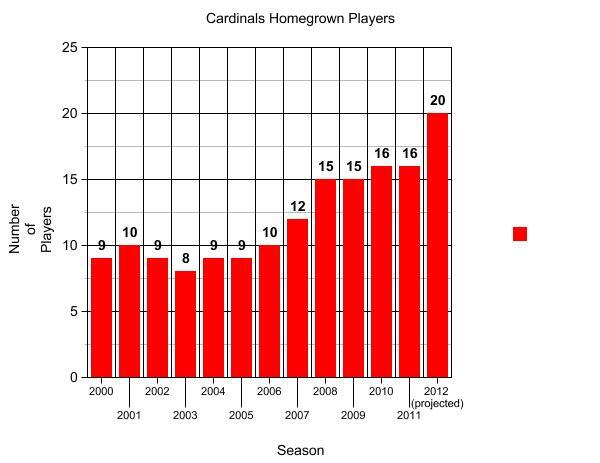 As it stands now, the 2012 Cardinals will have farm products starting at catcher, second base, third base and center field. Those players also will account for three starting rotation spots (with Chris Carpenter out) and four bullpen spots, with Eduardo Sanchez, Brandon Dickson and others waiting in Memphis. And look at the bench. With Cora and Hill gone, it figures to be Cruz, M. Carpenter, Greene/Descalso, Rule 5 pick Erik Komatsu and Shane Robinson. Fellow farm system products Skip Schumaker and Allen Craig will enter the mix when they recover from injuries, and Anderson, Mark Hamilton and Adron Chambers, among others, will be a phone call away. So, sure, the organization still is going to hand the occasional roster spot to the Scott Linebrinks of the world, temporary as that may be. It doesn’t change the fact that the Cardinals are now a franchise centered on building from within, a philosophy that only figures to step further to the forefront in coming years. Thanks, that’s a good point. And since these are the players who started coming up around 08-09, I think it only supports the idea (not that it’s controversial) that the Luhnow/Mo Era directly led to the shift. Yeah, I think it certainly lends credence to the theory that Luhnow/Mo have been good for the farm system and the big league team. I didn’t exactly pull these names out of a hat, though. Just Google search “cheap labor pitchershiteighth” which is a fun thing to search on anyway. The final out in the Series saw 7 home grown players on the field.